What the Truck – Page 12 – What the Truck?! Check out the Facebook event to RSVP and spread the word! The weather was touch and go for a while there, but when all was said and done, our first What the Truck?! 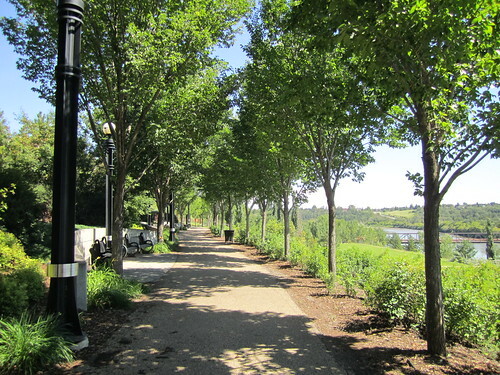 of the season was blessed with sunny skies and not a drop of rain! Given it rained in the hours leading up to the event, we weren’t sure what that would mean for crowds. But we should have had faith in the city’s food truck fans, who still turned out in droves to sample dishes from twelve different trucks. From vegan BLTs to mapo tofu and ahi tuna tortilla rolls, the vendors offered an incredible variety. Most of them sold out, thanks to the hungry festivalgoers! Although we strive to make all of our events family-friendly, this one seemed to attract even more young attendees. It was wonderful seeing children dancing, playing with one another, and having free run of McIntyre Park throughout the evening. 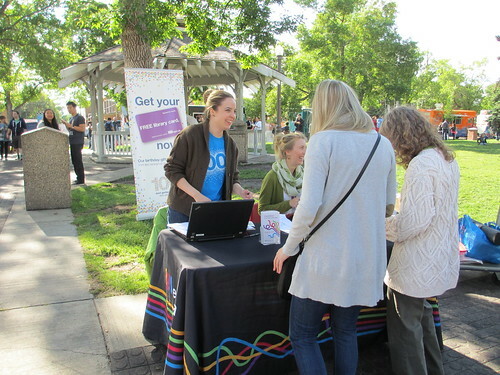 The Edmonton Public Library was on-site distributing free library memberships. They gave out a record 107 cards in four hours! 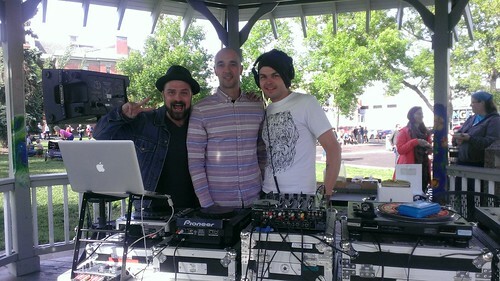 The atmosphere no doubt wouldn’t have been the same without the great tunes by DJs Thomas Scott (Urban Monks), Rob Clarke and Polyesterday. Thanks for sponsoring our event! 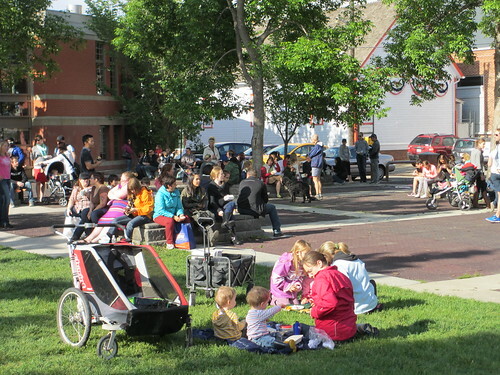 A huge thank you to our partner the Old Strathcona Business Association. Without them, the event could not have happened. This neighbourhood is already a destination for dining, shopping, arts and nightlife, so their support means even more. We would also like to acknowledge the Strathcona Community League, who also stepped up as a sponsor. Lastly, thank you to Donna, Francina, Jessica and Susan – the volunteers who helped make this a stress-free event for us! Many hands make light work, and this was not more true that night – you helped make the lines congruent, site spotless, and were game for anything we asked of you. We are in the process of planning several more events for this summer, so we’d like to take this opportunity to ask you for some feedback. We would appreciate it if you could fill out this survey about your experience. We are counting down the days to this Friday’s What the Truck? 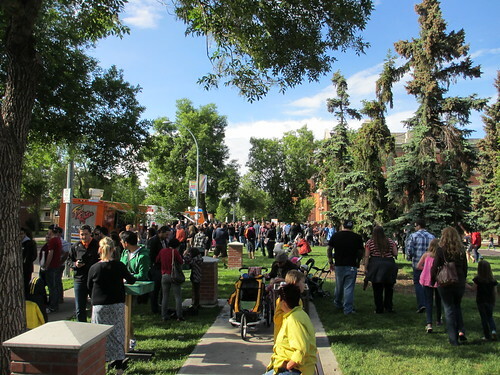 !, taking place on June 14, 2013 from 4-8pm at McIntyre Park (8303 104 Street). 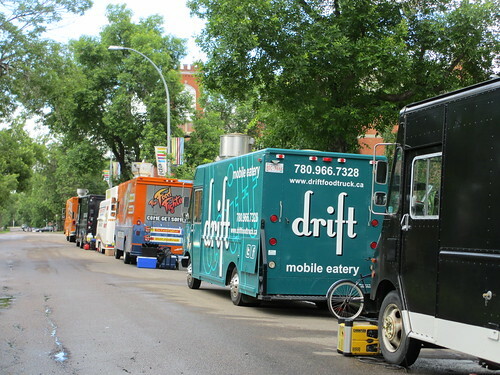 To give you a head start on deciding what to eat, check out the menus of the twelve participating trucks below. Curry Chips – fries covered in homemade curry sauce; a UK favourite! No, we never said it was going to be an easy decision. See you on Friday! We hope you’ve marked your calendars for our first What the Truck?! 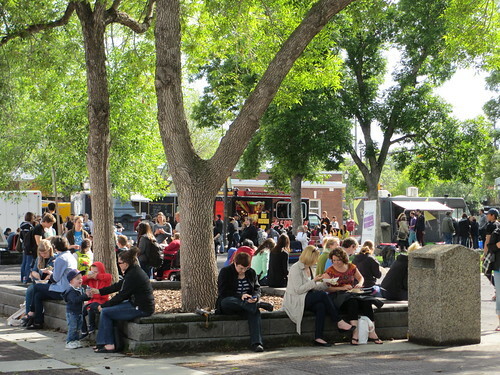 of the summer, taking place on June 14, 2013 from 4-8pm at McIntyre Park (8303 104 Street). Check back next Monday for a full list of menus. Get your appetites ready! As What the Truck?! has grown, we’ve realized that it helps to have additional hands around to pitch in on the day of. From set-up to clean-up, we’ve been very fortunate to have ad hoc volunteers join us at previous festivals to help make sure things are running smoothly. So it is about time that we do a formal, open call for volunteers before our first big event of the summer! Perks: our gratitude and food generously sponsored by Molly’s Eats! We will need 2-3 people per shift. If you are interested, please e-mail Mack by June 7. Thanks!